The fish faunas of continental South and Central America constitute one of the greatest concentrations of aquatic diversity on Earth, consisting of about 10 percent of all living vertebrate species. 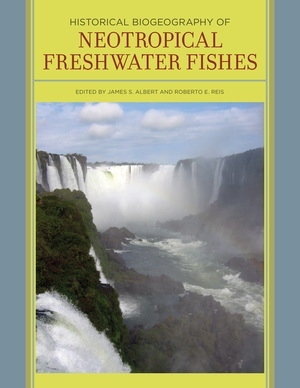 Historical Biogeography of Neotropical Freshwater Fishes explores the evolutionary origins of this unique ecosystem. The chapters address central themes in the study of tropical biodiversity: why is the Amazon basin home to so many distinct evolutionary lineages? What roles do ecological specialization, speciation, and extinction play in the formation of regional assemblages? How do dispersal barriers contribute to isolation and diversification? Focusing on whole faunas rather than individual taxonomic groups, this volume shows that the area’s high regional diversity is not the result of recent diversification in lowland tropical rainforests. Rather, it is the product of species accumulating over tens of millions of years and across a continental arena. James S. Albert is Associate Professor of Biology at the University of Louisiana, Lafayette. Roberto E. Reis is Professor of Biology at the Pontificia Universidade Católica do Rio Grande do Sul, Brazil.